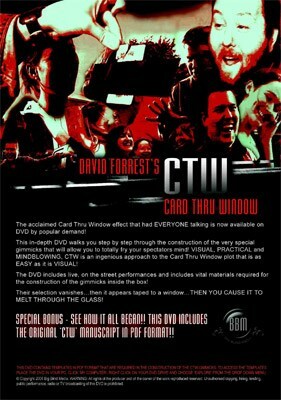 The acclaimed Card Thru Window effect that had EVERYONE talking is now available on DVD by popular demand! This in-depth DVD walks you step by step through the construction of the very special gimmicks that will allow you to totally fry your spectators mind! VISUAL, PRACTICAL and MINDBLOWING, CTW is an ingenious approach to the Card Thru Window plot that is as EASY as it is VISUAL! The DVD includes live, on the street performances and includes vital materials required for the construction of the gimmicks inside the box! Their selection vanishes...then it appears taped to a window...THEN YOU CAUSE IT TO MELT THROUGH THE GLASS! SPECIAL BONUS: SEE HOW IT ALL BEGAN!! THE CTW DVD INCLUDES THE ORIGINAL MANUSCRIPT IN PDF FORMAT! !